After The Haunting of Hill House, we thought Netflix might take a break from the horror genre. From most people’s reactions, they’d absolutely smashed it. But then along came Bird Box, and while it seems to have divided viewers – some saying it’s just ‘tense’, some saying it’s the scariest thing ever – Netflix are clearly tapping into their audience’s darker side. And with it, they’re finding out some obvious truths – a lot of people like being scared witless. So, as 2019 slowly gets started, Netflix are apparently rolling out even more films and series that fall under the horror label, and one in particular has caught the attention of fans of the genre already. While strange rumours about their ill king grip a kingdom, the crown prince becomes their only hope against a mysterious plague overtaking the land. Kingdom captured our imaginations from the moment we read the script with its visual feast of historical drama blended with supernatural fantasy. We are incredibly honored by this rare opportunity of pairing two premier creative minds in Korea – film director Kim Seong-hun and television writer Kim Eun-hee. The six-part series features some actors already familiar to Netflix’s audience, with Sense8‘s Bae Doona starring alongside Ju Ji-Hoon, Ryu Seung-Ryong, Kim Sangho, Heo Joon-Ho, and Jeon Seok-Ho. 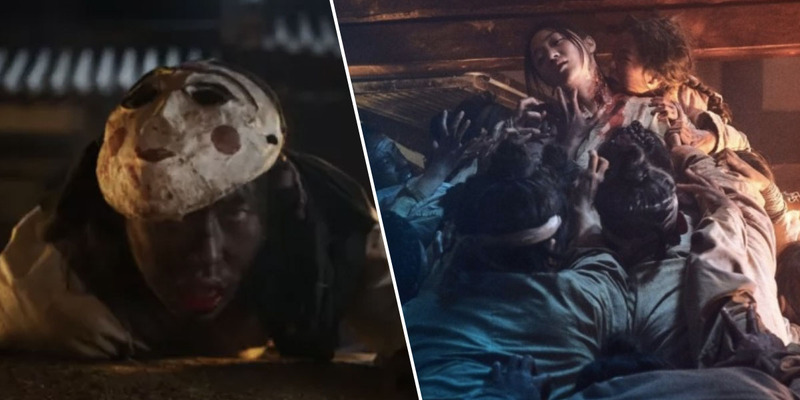 With Kingdom out at the end of this month, it seems the streaming service has some serious faith in it, as they have already renewed the zombie-horror series for a second season, which is expected to start production in February this year. It’s no wonder Netflix is sticking with the horror genre for a while. They claim a record-breaking 45 million people watched Bird Box in the first seven days of its release alone. According to Netflix, this is a record for the streaming giant and is the ‘best first seven days ever’ for one of their original films. The film, based on the 2014 novel of the same name by Josh Malerman, follows a pregnant Malorie (Sandra Bullock), as she joins a band of survivors, along with her two young children, in an attempt to escape an unknown force which is causing mass suicide. The mysterious force somehow causes anyone who sees it to take their own life. So Malorie must resort to blindfolding herself and her children. 2018 produced some of the scariest films and series to have ever been made, thanks to the likes of The Haunting of Hill House and Hereditary. Now it looks like 2019 might just top it.